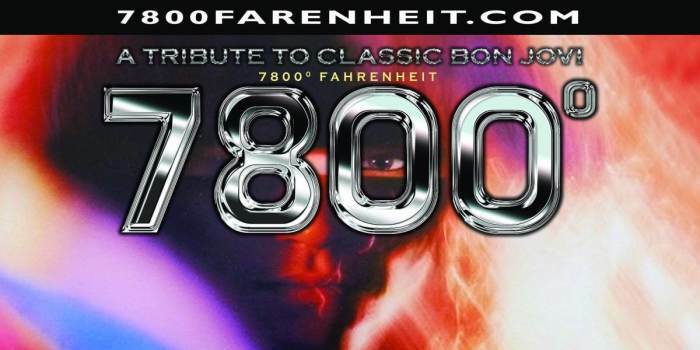 7800 Fahrenheit– A tribute to Classic Bon Jovi was formed in 2015 by Jay Orrell and John Young. 7800 Fahrenheit stays true to the classic Bon Jovi days with the look, sound, and energy. If you miss the good old days of the sound, hair & smiles, then you will not be disappointed! Bon Jovi’s career spans 30+ years and over 130 million albums sold worldwide. Another milestone that the band has achieved is that they have tracked 14 Billboard top ten singles of which 8 of those went straight to number 1, 7800 Fahrenheit believes that Bon Jovi has the right kind of song catalog, especially the classic songs, that really lends itself to being performed live as well as fitting into a broad age range that makes for the perfect club atmosphere.